If 20 fishermen made a top 50 list, or even a top 10, each list would be different. Some fishermen would rather catch one monster slab while other fishermen want more action even if fish are smaller. There is no right and wrong. This list uses five factors to be as accurate as possible, but some choices are subjective. So here goes, the picks for 2018. It was number #1 last year, is #1 this year, and will likely be #1 next year. 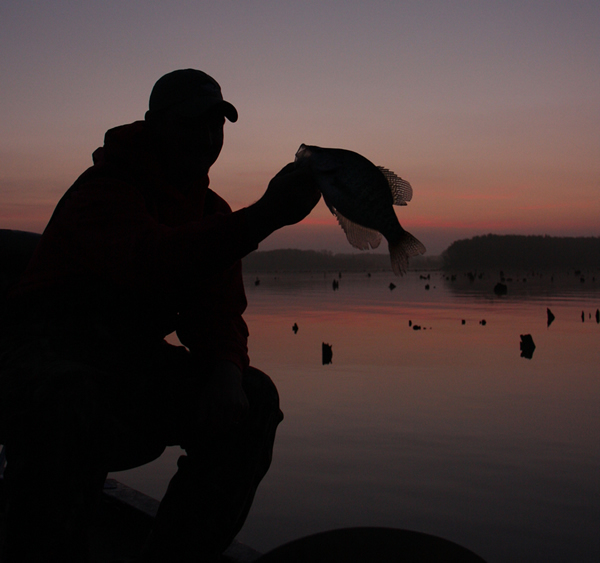 The 35,000 acres provides deep and shallow water, ledges, stumps, trees and plenty of shallow spawning flats. Mix super-fast growth rates with good management practices and it earns its title of “Home of the 3-Pound Crappie”. The third week of March is usually peak time to catch a really heavy fish. It’s been cooler than normal in January and early February so the timeframe may be a week later this year depending upon temperatures in March. After the spawn, look for fish moving out but still relatively shallow. When waters warm the lake becomes very good for trolling crankbaits. Washington is relatively small but it has big reputation for large fish. It was in the #2 spot last year too, but is barely holding on due to big fish numbers falling some, maybe due to extreme pressure and being an easy-to-fish lake. Flats 5 to 8 feet deep along with 15 foot areas provide a variety of depths. Growth rates are great with a four-year-old being two or more pounds. Slow trolling is a good pick but long lining is very popular due to limited cover. Try curly tail style jigs in any season and crankbaits from spring through fall. Sardis held this spot last year and is holding on strong. There are whopper crappie to be caught but it’s best known as having great numbers of good 1.5-pound plus crappie, more numbers than most other MS lakes. High points include: abundant, good fish; good lake for any technique; great summer crankbait lake; and a fantastic power trolling lake from spring through fall. Note: Similar to other MS lakes, Sardis quickly becomes dangerous with high wind so pay attention and watch weather reports. Also, summer recreation traffic is bad so fish early hours during hot weather. The Marion/Moultrie Lakes jumps from #12 last year to #4. The two lakes combine to create over 170,000 acres of diverse habitat. Fishermen say this system is making a good comeback as a producer quality fish in good numbers. It’s not the easiest to fish due to size and various types of habitat. A guide is good idea for the first day or two. Santee high marks include: beautiful, unique, back-in-time atmosphere; variety of depths and cover; numbers of good fish possible. A top pick is springtime vertical jigging in the vegetation for black slabs. Lake Fork jumped two spots from last year. Several different techniques work but it has taken top billing as the best jigging lake in the country. Over 27.000 acres with thousands of acres of standing timber makes it a jigging paradise. Excellent, huge slabs have been common for the past few years and more are waiting to be caught. Dropping a spot from last year, this is still a bucket-list place to fish. Though numbers of quality fish were down last spring, probably due to low water overharvest, it’s a place offering any style of fishing and numbers of awesome 2-plus pound fish. The Alabama River dropped a spot from last year. It’s difficult to rate because of its inconsistency. Constantly changing water levels, color and current makes it a challenge. However, when timing is right, it produces large quality fish from both the river and creeks with miles and mile of fishing. Arklabutla stays in the same spot only because of the hog crappie it produces. It’s a hit-and-miss lake so there may be several bad trips between every good one. Last year was good. It’s worth a try for a monster wall-hanger. The St. Johns River is made up of several different waters along with the river itself, so they all have an influence on this ranking. It makes the list even though numbers of quality fish are getting more to find. But, it has the prettiest crappie in the country. It’s a place to watch an alligator, have a manatee swim by the boat, and catch a crappie, all at the same time. Priceless. Monroe, Florida, jumps three spots to squeeze into the #10 position. It’s part of the St. John’s system and earns high marks because of the numbers of average-sized fish with a few kickers, and, it is a great January-February spot for a fisherman to start the year without freezing to death.